Auburn senior safety Tray Matthews, shown here returning an interception in the 2015 opening win over Louisville in Atlanta, began his college career at Georgia in 2013. Fun fact: Auburn senior kicker Daniel Carlson has made all 141 extra-point attempts in his career, and he is 8-for-12 in career field-goal attempts of 50 yards or longer. 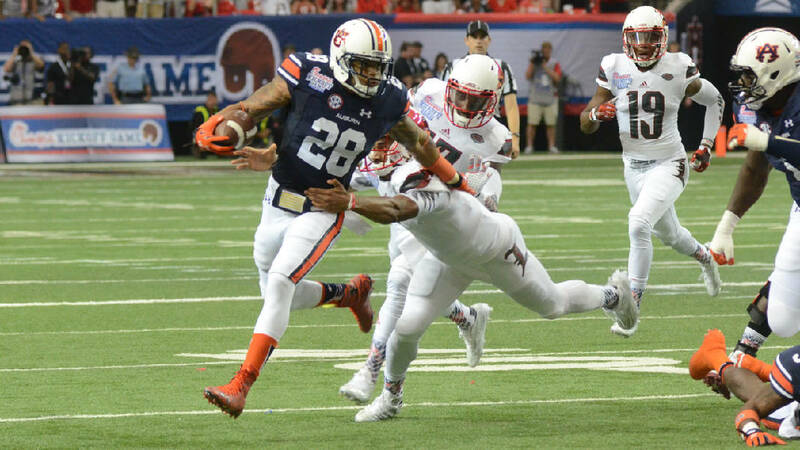 Auburn senior safety Tray Matthews is driven by a goal of leading the Tigers to their third Southeastern Conference football title of the decade but their first since 2013. What motivates Matthews even more stems from hearkening back to the turbulent first few months of 2014, which followed his promising freshman season at Georgia. The 6-foot-1, 209-pounder from Newnan, Ga., was arrested in March of that year on a "theft by deception" charge after cashing university stipend checks twice, and he was dismissed by then-Bulldogs coach Mark Richt that June. "We are trying to make room for guys who want to do things right," Richt said in a release that announced the departure. Matthews transferred to Auburn and sat out the 2014 season, and there were plenty of awkward, reflective and uncomfortable times during that stretch. "I started off low key," Matthews said last week at SEC media days. "I knew I had to cut down on the partying and hanging around the wrong people. I had to change my circle and go back to doing things the Tray way. My parents raised me right, and I kept a low profile at Auburn. "What embarrassed me the most was Mama crying and her having to read the blogs and hear this and that about her child. Most of it wasn't true, but she still had to listen to people downing her kid. My dad could take it, but my mom took all that stuff to heart." Imagine someone getting fired from one company and becoming CEO of the next, and that has been the Tray Matthews college experience. Once ridiculed and trashed in SEC circles, Matthews is arguably the most valuable member of a defense that performed a stunning turnaround last season in Kevin Steele's first year as coordinator on the Plains. Facing a schedule that contained the explosive likes of Clemson, Ole Miss, Alabama and Oklahoma in the Sugar Bowl, the Tigers allowed 17.1 points per game to rank seventh nationally. Auburn had allowed 26 points a game with Will Muschamp as defensive coordinator in 2015 and 26.7 points in Ellis Johnson's final season as coordinator the year before. Matthews battled shoulder setbacks two years ago but flourished last season with a team-leading 76 tackles. He had a combined 14 tackles, one interception and a pass deflection in late-season games against Georgia and Alabama. "Tray Matthews led us in tackles last year, and he really is our leader on defense," fifth-year head coach Gus Malzahn said. "He's probably our team leader." Steele last season actually started to use the term "CEO" to describe Matthews, who is working toward a master's degree in Auburn's College of Education. Steele is the fifth coordinator Matthews has played under, following Muschamp and Johnson at Auburn and Jeremy Pruitt (spring of 2014) and Todd Grantham (2013 season) at Georgia. "I've taken things from each and every one of them and their coaching styles, and I think that has helped me out a lot," Matthews said. "Coach Steele definitely hasn't gotten enough credit for what he's done here. He's an amazing coach and an amazing person. He's one of those coaches you want to play for and put your life on the line for. "I've always had a different coordinator each and every year, and to finally have the same defense with the same coach is great. We have each other's trust. We mesh together very well. It's going to be smooth for me and the whole team." Matthews has been in college football so long that he can boast of covering former Clemson receiver Sammy Watkins in 2013, as well as LSU's duo of Odell Beckham and Jarvis Landry that same year. He has never been on the winning side of the Auburn-Georgia rivalry but insists he doesn't feel any different heading into that matchup. Auburn defeated Georgia 43-38 in the 2013 game, which contained the 73-yard touchdown connection on fourth-and-18 from Nick Marshall to Ricardo Louis that instantly became known as the "Prayer in Jordan-Hare." Matthews was deep on the play for the Bulldogs and was in position to make the interception, but Josh Harvey-Clemons collided with Matthews, and Louis caught the resulting ricochet. "When I first got to Auburn, a couple of players said some stuff here and there about that play," he said, "but once I became part of the family, they didn't want to talk about it. Josh Harvey was the one who got in the way. The ball was coming right in my hands, but I didn't touch it at all." Matthews has kept in touch with former Georgia teammates such as Davin Bellamy and Leonard Floyd, but the player who keeps inspiring him most is former Tennessee and current Kansas City Chiefs safety Eric Berry. The two talk often, according to Matthews, who calls their relationship a "great experience." A potentially big senior season awaits Matthews, and his Tigers are considered the SEC team with the best chance of knocking off Alabama. Getting dismissed from Georgia always will be part of his story, but it's an episode that seems to have made him stronger. "At Georgia, I was an immature freshman, and I just had to grow up, and that right there grew me up quick," he said. "From that point on I've never had a problem, because I don't ever want to see Mama cry again."